Welcome to the lovely Scottish county of North Lanarkshire. If you need child friendly ideas where to take the kids, kids days out, or fun things to do with the kids in North Lanarkshire then we can help. We have family pubs with kids play areas, soft play areas, indoor play areas, outdoor play areas, playgrounds, aquariums, castles, stately homes, children's clubs such as Scouts, Cubs, Beavers, Brownies, Guides, youth clubs, activity centres, Air, Sea, Army Cadets. We list children's entertainers in North Lanarkshire if you are planning a birthday, cinema, theatre, petting zoo, animal farms, children's farms, leisure hire, museum and art gallery, nature areas such as parks, and countryside walks and beaches. We have kids activities related to outdoor pursuits and sports such as swimming, ice skating, ten pin bowling and football centres. We list theme parks and Adventure Parks in North Lanarkshire. If you are looking for zoos with more exotic animals then we have them. Don't forget to look at the nearby counties of Scottish Borders, Dunfries and Galloway, Lothian, Central, Tayside, Highlands, to see what they can offer you. We have days out with the kids in North Lanarkshire in and near :- Airdrie, Bearsden, Clydebank, Coatbridge, Cumbernauld, Dalmellington, Glasgow, Greenock, Irvine, Kilmarnock, Kirk of Shotts, Motherwell, Paisley, Wishaw. 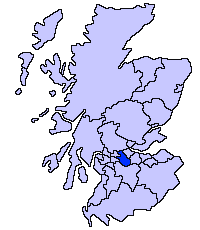 North Lanarkshire is one of 32 council areas in Scotland. It borders onto the north east of the City of Glasgow and contains much of Glasgow's suburbs and commuter towns and villages. It also borders Falkirk, East Dunbartonshire, West Lothian and South Lanarkshire. The council covers parts of the former counties of Lanarkshire, Dunbartonshire, and Stirlingshire. The area was formed in 1996, largely from the Cumbernauld and Kilsyth, Motherwell and Monklands districts.